This web portal interfaces with all your online storage services and even your local data. If you have data scattered across multiple online storage services such as Google Drive, One Drive, etc., then you know that it can difficult to keep track of it all, let alone keep them in sync. Enter MultCloud by Aomei, a Web-based app/portal that lets you transfer and sync data between online services. Even better, it’s free for up to 2GB of data a month. That’s easily enough for the average user. There is a paid version ($8 monthly, $20 quarterly, $70 yearly) with advanced features, multiple accounts, scheduling, etc., for power users and IT, but we’ll review that at a future date. For now, gratis baby! And no, it’s not a misspelling—there is no “i” in MultCloud. As you can see in the image below, MultCloud supports a number of popular online destinations. The elephant in the room is the lack of iCloud, but Apple doesn’t let any third-party software connect to iCloud, so that’s not Aomei’s fault. It’s also why I don’t rely on iCloud, even with my Apple gear. Many of the more popular online storage services are supported. Just about anything with an open API. That means it’s Apple’s fault iCloud is not supported. 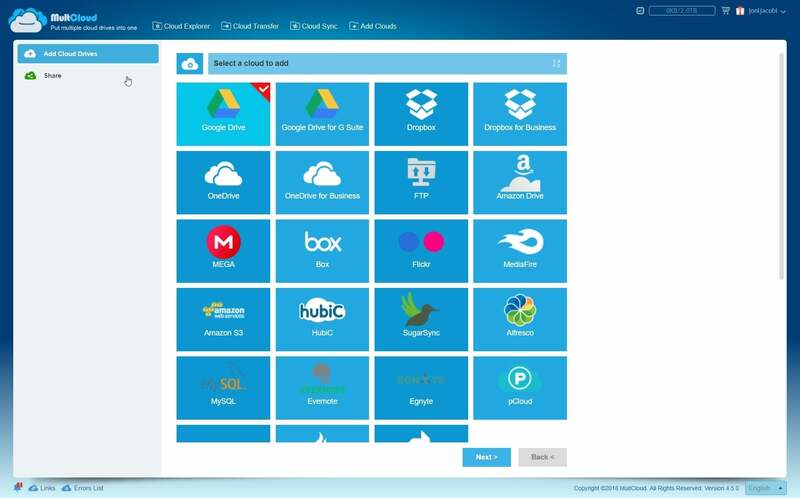 To set up a service for use with MultCloud, you just select it from the list and log on at the prompts. If you’re already logged on to the service with your browser, MultCloud will detect that and bypass asking you to enter your user name and password. You still have to explicitly allow access, but it is a lesson in what surfing to the wrong site could lead to. To transfer or sync data, you’ll obviously need to connect to at least two services, after which you simply select the source and destination folders and let MultCloud have at it. Part of the deal with the free service is that you can’t save jobs--you must redefine them every time. A pain, but considering the price, livable. The transfers section gives you options and scheduling, but the latter is just a bit of a tease for the paid version. My only other complaint about MultCloud free was logging onto the website. The “remember me” function didn’t work, which forced me to type in my user name (email), password, and a case-sensitive “I’m a human” verification code each and every time. It’s a pain, but again, it’s hard to complain about details when everything is free. Hopefully, it’s not an issue with the paid service, though automating things after you fork over cash should mean fewer visits. As MultCloud exists only online, it’s great for mobile device users, but it won’t work for a laptop or PC unless you make them Internet-accessible via the venerable FTP, that is, File Transfer Protocol. This requires enabling your computer as an FTP server and forwarding FTP to it from your router. You can upload data from your local PC or network if you understand how to set up FTP. Shown here are the folders on one of my NAS boxes, which is where I have my router pointed for FTP operations. Setting up FTP isn’t particularly difficult. For most routers, seek out the port forwarding section of the configuration pages and forward port 21 to the IP address (e.g., 192.168.1.104) of the computer. To set up your PC as an FTP server, read this TechHive article on backing up using NAS boxes via FTP. It’s a ways down in the article, but described step by step. Note that file access via WebDav is also supported for more advanced users. A possibly easier solution (other than buying your techie friend a beer) for backing up local files to multiple destinations on the Web is Cloudberry Backup, which is also available in a free version. My biggest issue with Cloudberry Backup is that, last time I looked, it didn’t handle Dropbox, which just happens to be my main online repository. MultCloud free is handy as heck, though because of the always-manual operations, it’s only good for one-off operations and occasional house-cleaning. It’s of course a bit of a tease, but companies can’t exist on good will alone, and MultCloud is a lot easier than than most alternatives. Fair warning, I found the dangling carrot of automatic, hands-off syncing and backup between services enticing. If I truly had the need, I wouldn’t hesitate to pay, as MultCloud makes the whole deal very easy, except perhaps the FTP part. IT and power users should take a look at the pay version. Anyone else with multiple online storage accounts should surf to MultCloud and take a look.